Crimson Wolf Productions, Ltd., was formed in January 2005 as a North Carolina based corporation specializing in the production of original feature films and series for the domestic and international motion picture, television and direct-to-video markets. Our strategic business objective is to produce a regular series of low risk, low cost, well crafted, quality motion pictures for known markets with a proven history of financial return. The combined experience and work history of the principals provides a diverse background in both finance and film production, with a proven track record of success in this field. Although the company itself is new the partners who make up Crimson Wolf have decades of combined experience in the fields of business, finance and the production of motion-pictures and television. Hailing from Portsmouth, Virginia, John has spent many years in the artistic settings of New York, NY, Washington, DC and Los Angeles, CA before making Lewisville, North Carolina his permanent home. 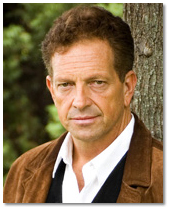 John has over 20 years experience as an actor, posting regional theatre performances across the US. He has also been featured in numerous commercial campaigns and as a film actor has worked with Michael Keaton, Nick Nolte, Rae Dawn Chong, Pierce Brosnan, Robert Wagner, Christopher Walken, Cliff Robertson, Jacklyn Smith, Adrian Paul and the late Natalie Wood. He was a principal player in the feature film, Little Chicago and had a major role in the film Eyeborgs playing DHS Agent Bradley. John�s acting prowess took him to Los Angeles in the early 1990�s where he combined a wealth of business and advertising experience with his artistic roots and accepted the position of Executive Director of Mothers Against Drunk Drivers in Southern California. In this stead, John produced and directed Sober Prom, a touring, multi-media presentation performed yearly to high schools in California. Included in this presentation were PSA�s and shorts, written and produced by Mr. Rushton staring cast members from the then top-rated television show, Beverly Hills, 90210 and Connie Seleca and husband, John Tesh. John also worked with Gene Siskel, Roger Ebert and Leeza Gibbons on the nationally acclaimed television special, Siskel and Ebert Look at Substance Abuse in the Movies, which he Co-Produced as well as producing bi-lingual programming for community activist groups in Southern California. As a director, John has mounted theatrical shows on both coasts, and is currently President, Artistic Director and Founder of the West Side Civic Theatre. He has directed numerous commercials and industrials throughout the country, including television infomercial campaigns for Diet Lite and Sweet D-Lite and PSA�s for organizations like The Coalition for Drug Abuse Prevention, Hawley House and Big Brothers/Big Sisters of America. His original video of Michael Jackson�s, Who Is It was featured on MTV. John is also a nationally--recognized playwright. His play, Once Upon a Midnight Dreary, based on the life of Edgar Allan Poe received a NEA grant and was performed to sold-out audiences at the Industrial Strength Theatre in Washington, DC. He recently won the Thornton B. Wilder National Playwriting Award for his two-woman play, Life�s Mistress, chronicling the life of the famous dancer and woman�s liberator, Isadora Duncan. John currently serves on the Board of Visitors for Salem Academy and College and is a member of the Special Events Committee for Adrian Paul’s International Children’s organization, Protect and Educate All Children Everywhere (PEACE). Most recently he served as Producer on the feature film Eyeborgs. 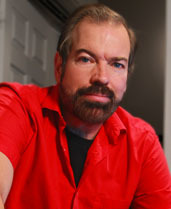 John is a full partner and CEO of Crimson Wolf. Richard Clabaugh is a veteran filmmaker whose work as a cinematographer and director over the past two decades have given him the opportunity to work with such industry luminaries as Russell Crowe, Viggo Mortensen, Naomi Watts, Peter O'Toole and Christopher Walken. Clabaugh began making movies when he was eight years old, constructing narratives with his father's 8mm movie camera. He won his first film award at the age of sixteen and would go on to win multiple awards from the WEDU Young Filmmaker's Festival, the Florida Independent Film Festival, the Kinetic Image Film Festival, the Central Florida Film Festival and the highly prestigious Ann Arbor International Film Festival all before the age of before he was twenty-one. Following high school he worked for the local CBS News affiliate and for an independent news station, first as an editor and then as a photographer. His work as a news cameraman earned regional Emmy and UPI awards recognition for the station, including a Best Videography Emmy (statewide) for WTOG-TV during his tenure as Senior Photographer. During this period he continued to be active in film production, working for a professional special effects and animation company and gaining extensive experience in miniature and effects photography as well as live action, 35mm cinematography. In 1985 he and his wife moved to Los Angeles where he began a successful career as a Hollywood cinematographer. Over the next decade and a half he would work on such films as The Prophecy, starring Christopher Walken, Eric Stoltz and Virginia Madsen, Phantoms, with Ben Affleck and Peter O'Toole, No Way Back, starring Russell Crowe, American Yakuza, starring Viggo Mortensen, and dozens more. In 1999 he directed his first feature, the highly successful cult-hit Python, starring Robert England, Casper Van Dien, Will Wheaton and Jenny McCarthy. Python was an international hit theatrically and was released to video in the United States by Twentieth Century Fox. It went on to spawn three sequels to date and continues to do great business in video rental as well as being regularly played on the SciFi Channel. Following Python he accepted a position as a cinematography instructor at the prestigious North Carolina School of the Arts (now the University of North Carolina-School of the Arts) and moved with his family to Winston-Salem, North Carolina. After nearly a decade as a film instructor he had returned full time to making movies. Since moving to North Carolina he has served as a director on the independent feature film Little Chicago. Richard co-wrote and directed the feature film Eyeborgs which is currently in post production with Crimson Wolf. Richard is a full partner in Crimson Wolf Productions, Ltd., and joins the crew of Eyeborgs as producer, co-writer and director. 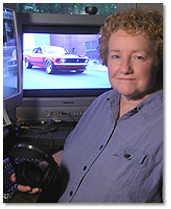 Fran Clabaugh was working as a Cadastral mapper for the property appraiser's office of Pinellas County, Florida in 1980 when she became involved with a group of aspiring filmmakers known as the Kinetic Image Film Group. Many of the people from that small Florida club moved to Los Angeles and went on to prominent careers in the motion picture industry. Fran, who had long been interested in story development, screenwriting and motion picture editing, found the group offered her ample opportunity to develop her skills in those areas before moving, along with her husband Richard, to Hollywood, California to pursue a professional career in the motion picture and television field. Fran immediately found work in the Los Angeles film industry starting as an Assistant Editor at Action International Pictures (AIP). Her duties included synching and preparing the 35mm film dailies and assisting in various aspects of 35mm editorial post production on feature films produced by the company. During this period Fran attended a UCLA extension course about an exciting new development in the editing field. George Lucas has created a new method for editing using a computer based, non-linear system, the first editing system using electronic means to edit professional motion pictures instead of the old fashion, tape and scissors approach to cutting film. The system was known as "Edit-Droid," and Fran became one of the first people to receive training in this new technology. Later Lucas would sell the rights and concepts to another company which would revise the system further and market it under the name "Avid." Today electronic editing has become the norm and Avid has, for the past two decades, dominated the field of professional editorial post production, all but eliminating the old method of cutting and splicing film by hand. Fran took a break from the industry to raise her two children. In 1999 she returned to the East coast, along with her husband and family, moving to Winston-Salem, North Carolina. In 2002 she again took a seat in the editing room, this time as full editor on the independent feature film Little Chicago. Always on the cutting edge, Fran utilized the latest version of Apple Computer's "Final Cut Pro," a newer and more sophisticated rival to the Avid system. At the same time Academy Award winning editor Walter Murch and others were also starting to turn to Final Cut Pro, using essentially the same system for the editing of "Cold Mountain." Together with her husband they tested the waters of full, desktop digital post production on their High Definition digital feature film. Working through the entire post production process they were able to debug and optimize a system for doing fully professional, high-quality feature films using highly affordable systems, a principal at the heart of Crimson Wolf's production of Eyeborgs. Fran joins the Eyeborgs production team as co-script writer and editor. She is a full partner in Crimson Wolf Productions, Ltd. In addition to her work on this film she is currently developing additional stories and screenplays for future production.